Superdrug have been challenging consumers to save on their beauty shopping by switching their favourite summer products to cheaper equivalents in its own brand ranges. Always up for a challenge, I decided to take part myself to see if I could find some hidden gems along the way. Regular readers will know that I love multi-purpose products and oils are something that I use a lot of all year round. My current favourite is Caudalie Divine Oil and Superdrug matched this to the Dry Oil from their bestselling Vitamin E range. Now this of course wasn't going to be a straight dupe, but I'm really happy to have discovered their Dry Oil because it's great! It's made with ingredients such as Argan, Moringa and Jojoba Oils so it feels very hydrating on the body and also works well as a pre-shampoo hair treatment too. Caudalie Divine Oil has a unique scent that I have yet to find a budget version of, but Superdrug's Vitamin E Dry Oil smells lovely and fresh in its own right. A steal at just £2.99. Before the challenge, I was actually using up a bottle of B. Pure Micellar Water because I'd run out of Bioderma so this was a perfect match! I've tried a lot of micellar waters and the B. offering is still one of the best alternatives to Bioderma around; I definitely prefer it over Simple, Garnier and L'Oreal. It feels like water on the skin but removes all of my makeup including waterproof mascara so I can't recommend it enough. It's also often on offer which makes it even more affordable. Mud masks can often be very samey in my experience, but Caudalie Instant Detox Mask is truly a HG favourite of mine. When Superdrug matched it to their Dead Sea Mud Mask, I wasn't expecting much but again I was surprised. This is one of the best budget face masks I've tried and it does a great job at unclogging pores so ideal if you have blemish prone or congested skin. The results however weren't as outstanding as the Caudalie one, but at a mere fraction of the price, this is still well worth picking up. SPF is vitally important if you want to keep wrinkles at bay but many feel greasy so I always opt for a mattifying formula that I can use on my face. Eucerin has been my brand of choice for over a year now because I love the texture and it doesn't break me out, so I was interested to see how Superdrug's Solait alternative would fare against it. It does the job as in it protects my face, but I found the mattifying effect to only last an hour or so. It also had a tendency to ball up a few hours after application if you are wearing make-up which wasn't great. It's a good budget option for make-up free days for sure and I will use the rest of the tube, but it's not on a pare with the Eucerin sadly. Like many, I'm a big fan of Liz Earle's cult Cleanse & Polish and always have a tube of it in my bathroom. There are lots of supposed dupes out there but I have yet to find one that matches it. 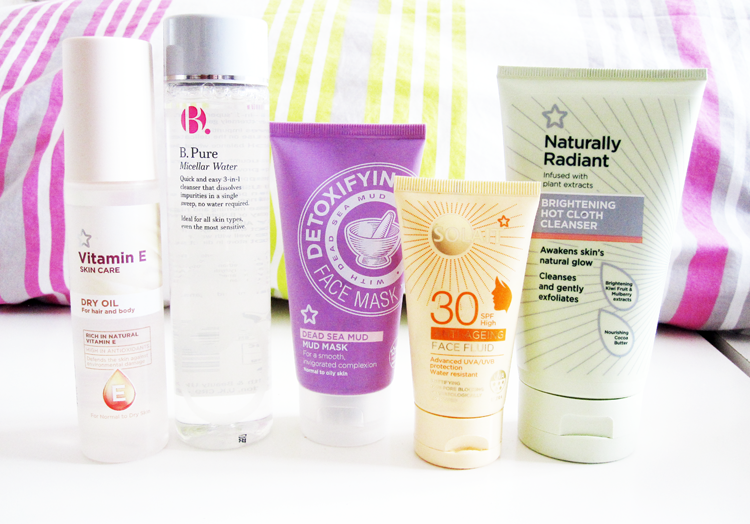 Superdrug's offering is definitely one of the best alternatives to try. It doesn't feel as thick or creamy as the Liz Earle, but it works in the same manner and removes make-up almost as well. I did have to use a bit more of this product to cleanse my face as I would have done with Liz Earle's, but that's really not too bad as the price of this is so cheap that it still works out very cost effective. Give it a go! On just these five swaps, I would have saved a whopping £72.20 compared to the retail price of the branded products! All of Superdrug's own brand ranges are also cruelty free. The Superdrug Summer Swap is on until the end of August so you still have a couple more days to take advantage of this promotion. Simply pop into your local store, ask staff to recommend you some own brand alternatives to purchase and then if you're not 100% happy with them, you can return it and receive a full refund under the Money Back Guarantee. You'll also receive a 25% off voucher to use on another own brand product so you can try something else for less. Are you a fan of any Superdrug own brand products? I adore their vitamin E range, its defiantly my favourite! Superdrug offer some great products. I really like their Deep Clean range and a couple of their Tea Tree products are also really nice.